Know anyone else who would be interested in these awesome completely pre-formatted environmental resumes? 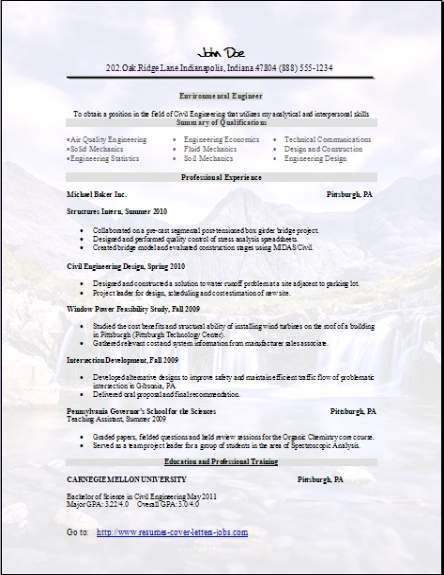 If so then just e-mail them this resume page using our bookmark button below. Download your choice--when your file opens, just choose save as--where-save on Desktop--leave the file name exactly like it is now. That way when you decide on starting to edit your resume, you will find it really easy. An environmental engineer's job description really only has two main areas for you to deal with, finding remedies for all of the existing environmental threats, and developing the solutions to prevent and control anything that might happen in the future relating to environmental health hazards. As an environmental engineer, your job description will include lots of research and strategy, as well as the more mainstream environmental engineering every day duties. While wastewater treatment may seem like an undesirable duty, it will more than likely be a part of your many environmental engineer job descriptions assignments, as a lot of areas become more populated. An environmental engineer job description will also include working in partnerships with construction contractors to minimize any environmental harm while new building projects are completed, or executing a plan to eliminate the environmental risks of that project so that it can still be completed. You will have a rather unique opportunity to make a huge difference in the world and in the future with your hard work and ideas, to improve the environment all around you. For an entry-level environmental engineering job you should have a bachelor’s degree. Programs will include classroom training, laboratory, and also field studies training. Most universities offer some type of cooperative programs that you can gain practical experience in and at the same time, complete a universities education program. 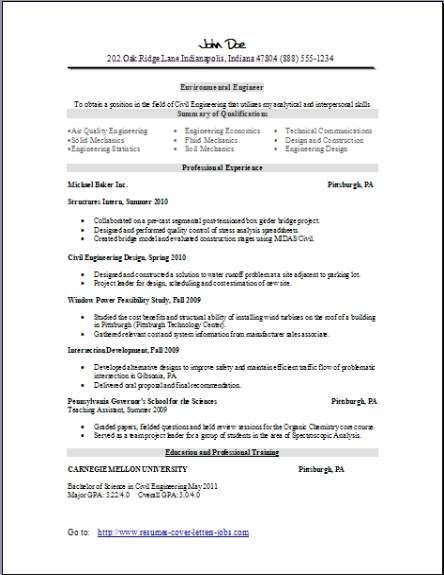 Easily edit any resume format above so you can create and turn it into the resume below you want.